>100 RENOVATION COMPLAINTS were lodged with CASE each month, for the last seven years. If you are in the process of choosing a renovation contractor or interior design firm, invest the next 20 minutes reading this article. AVOID the months of misery, agony, stress and anxieties as another victim of renovation cheats and frauds. The average homeowner will spend years to save up for renovation. And some will spend years to pay up their renovation loans. Why lose your hard earned savings to scammers or irresponsible contractors? The POLICE can't help because it's a civil case, not criminal. Every year for the last seven years, more than 1200 victims fall prey to renovation scams in Singapore. And before you silently assure yourself that …. ”Hey, It won’t happen to me”…..think again. A great percentage of victims did some form of due diligence, they were cautious, and yet, they ended up losing their life savings to professional scammers. The AUTHORITIES .... CaseTrust, HDB, SMALL CLAIMS can't help when the companies shut down. YOU owe it to yourself to know what you're getting into! How vulnerable are you to home renovation scams? Take a quiz to find out. Overview of the renovation industry and the number of complains over the years. What is the most bullet-proof and comprehensive approach? Enough information has already been written about renovation scams, cheats and frauds. But you just don't find a one-stop shop whereby information is constantly updated and includes what we believe to be a full-proof approach to tackling these issues. This article is written with the homeowner in mind, to provide you with all the information needed before you make a decision about which interior design firm to go with. It's written with ONE GOAL, for you to dramatically reduce your risks of being a victim of home renovation scams. And we’re taking it seriously, on a quest to make a difference to the renovation industry.... one reader at a time. SPREAD THE WORD .... share this page, so that together, we can stomp down on the bad apples. Anyone who is about to engage an interior design firm for renovation should benefit from the information provided here. An overview and insights of the renovation industry and the number of complains filed according to CASE. Take a dive as we drill into the real-life stories of recent years where victims share their experiences or when a case is published. Follow us through a detailed two parts twenty points checklist, so that you will avoid becoming the next victim of renovation frauds. Once again, the renovation industry continues its reign in the top ten lists of consumers complaints. Ever wonder why the renovation contractor industry hold the title of having one of the highest numbers of complaints filed to CASE in the past decade? It’s not that surprising because it’s still a loosely regulated industry. Consider that fact that anyone can just simply register a company, find a shop space and start operating a renovation business. And at the same time start claiming that they are Interior Designers and collecting payments. What’s worst is that these bad apples of the industry can just fold up their companies when the scams and complains are too widely publicized. And just open a new company with a new name to continue with their deceptive ways. To date, there is no regulations or laws in place to stop them from doing so. According to Consumer Association of Singapore (CASE), there were 1269 complains against errand or rouge contractors in 2016. And 719 complaints for the first seven months of 2017. This works out to an average of slightly over 100 complaints per month in 2017. Should the trend continue, we’re likely to see no less than 1200 complaints in 2017, not too different from 2016. Though 1269 complaints represent a 12% drop in complains year or year compared to 2015, it may not reflect the actual figures of unhappy homeowners. And unless the governing bodies intend to take drastic measures to arrest these issues, we’re not likely to see any significant improvements to customers complains over renovation companies in the foreseeable future. Which means that you as the homeowner and end consumer, is at the disadvantaged end of the transaction. And you want to equip and protect yourself from becoming a victim of these scams. 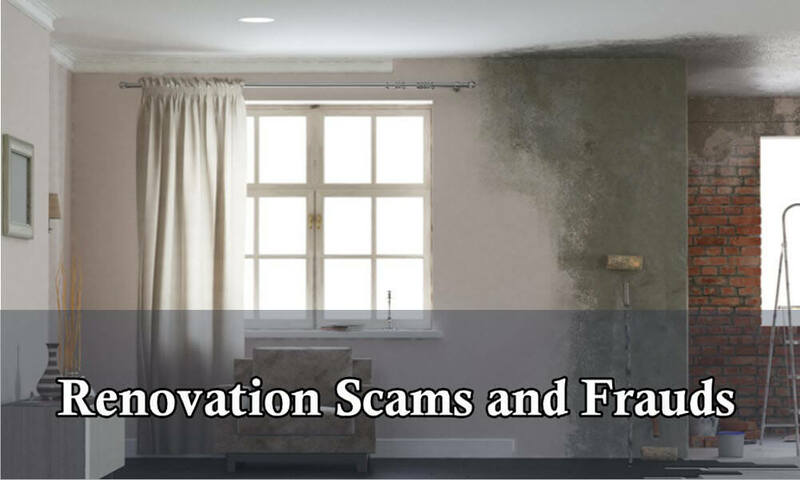 True stories of renovation scams below, which is constantly updated when new cases emerge, can help you to understand what went wrong. From these stories, valuable lessons can be learned so that you wouldn't fall prey to the same traps as the thousands of homeowners had over the years. One would that thought that today where information is easily available on the web, how is it possible to cheat eighty-nine victims over less than 2 years right? One cannot imagine that just 21 of the charges alone involves some $770,000. Even sub-contractors were not spared from the devious deception. The case is currently still pending, and the defendant shall be back in court on 3 Sep 2018. For the full scoop of this case, you can read the full report here. If you find a renovation deal that is too cheap to be true, it probably is. To convince yourself that it's a legitimate deal, you should do a background search on the company and check out the companies’ reviews on the web. If they have disabled reviews and comments on their FB page, then you should dig further into forums and possible complains filed anywhere else. You can find more than twenty five home renovation packages here. Use them as a guide when making comparison. If you can find a deal that is 40% cheaper than the ones listed above, you should probably think thrice before proceeding. This is a classic story of “when it’s too cheap to be true… it’s probably too cheap to be true”. The homeowner thought he discovered gold when the salesperson of this company quoted him an unbelievably cheap deal. The $1000 plus 40% advance deposit does not put him off or raise any red flags. Again, this homeowner thought he has already done his homework by engaging an ID firm. He did not drop by to inspect the progress regularly enough. When asked to transfer the full balance payment, he did so thinking that all is in order since the ID guy updates him regularly enough. Turns out, the updates were false, and works were halted long before because the workers were not paid. Whether its just the scheme of a single salesperson or the company at large we have no idea. One other owner who faces similar experience with another salesperson from the company lodged a police report. If you like to read the full report, you can click here. Let’s assume that every homeowner would at least bother to get at least 3 – 5 different quotes from ID firms. You can conveniently submit an enquiry for a renovation quote here. And if one of the quote obtained is significantly cheaper by 30 - 40% than others, one should be questioning how is that possible and investigate further. Payments should always be made via traceable means like a cheque or cashier order etc. And it should always be made payable to the company and not to the salesperson or ID guy. If you’re ever asked to make personal transfers or pay cash to the salesperson instead of the company, don’t. Legally, the company has not received your payment and so if things goes south, like a runaway conman, who do you pursue? Though this story is not widely publicized except in forums, it’s worth sharing here. This homeowner was tricked when he found a renovator who charges some 40% cheaper than other ID firms. He didn’t find it unusual that he was made to pay more than 50% upfront in payments. He shared that he made a mistake by not obtaining any form of receipt for payments made to the company. And that proofs of Internet banking transfers may not be sufficient as evidence in court. Full details here. Another classic when it feels like it’s too cheap to be true…. It’s indeed too cheap to be true. Whenever homeowner make payment to an ID firm, it should be made to the firm and not to the names of a salesperson. And official receipts must be collected in return for the payment. Never make payment when the salesperson assures you that the receipt, once prepared, will be forwarded to you. Demand it in exchange of your payment. And never agree to pay more than 10% at the initial signing of agreement. All CaseTrust/RCMA accredited ID firms are only allowed to collect a maximum of 10% deposit, so as to protect homeowners from errand ID firms. This company, who is a HDB licensed contractor, became suddenly not contactable. Five complains were lodged with CASE regarding uncompleted works. The company website was down. The salesperson no longer contactable. CASE mentioned that consumers should exercise prudence when selecting their renovation contractor. In this particular case, the seven year old company had received prior suspension from HDB. And their paid up capital is merely $100 according to ACRA records. Full report here. Though there were only five reported cases in this instance, we cannot rule out the possibility that more victims were involved. It's just that the amounts were small and some homeowners just decide to save themselves the trouble of pursuing over a few thousand dollars. As a precaution, when renovating a HDB home, not only should you check that your contractor is licensed by HDB. You can also see if the company concern has a past history of suspension or face demerit points. Though these are not conclusive that the company is likely to scam you, it's still tell tale signs of the company you're dealing with and their work ethics. For how to check ACRA and HDB sites for information with links included, be sure to read the ultimate 20 points guide found further below. 27 May 2017 – Homeowner thought engaging an ID firm through a renovation platform would be safe. This Sengkang flat owner chose an ID firm referred by the renovation platform Renopedia. She paid the initial closed to 20% deposit. She then proceeded to pay the full amount from their four years of life savings to the company. The company did not follow through with their obligations and now the family is living in a half-renovated home. Full story can be read here. Just because an ID firm was recommended by a renovation platform, it does not mean that they are not liable to financial difficulties, complains and failure to deliver. While some renovation platforms offer a buyer protection scheme, the inconveniences, emotional stress and time-consuming efforts you must go through to claim back what’s yours can be astonishingly cumbersome. Furthermore, do you honestly think that renovation platforms would take great pains to investigate and screened through every single ID firm that is happy to pay a subscription on their platform? You want to do your due diligence and be well equipped, so that you can make a wiser choice when picking your ID firm. Why the couple paid 90% in advance we will never understand. If only they had bothered to check, they would have sensed some alarm bells that the company concerned is not accredited under the CaseTrust scheme. And though they are renovating a private apartment, a search on HDB directory revealing that the said ID firm license had been terminated would have raise more concerns. If an ID firm is facing challenging financial issues and on the brink of closure, resorting to debt collection companies, lodging a police report or complaining to CASE wouldn’t really help much. If only they had done their due diligence to check the background of the ID firm concerned. For the full detail of this case, you can click here. The victim also explained that they have 5 different quotes from different renovation companies before deciding on this firm. And the main reason for their decision was because the ID could communicate better and really understand what they want. At no time should a homeowner pay upfront in advance for work that is yet to be done or commence. Always negotiate for a progressive payment scheme. The victim also failed to make regular checks on the progress on the renovation works. In this case, entrusting everything to the ID firm and not visiting to oversee the progress for more than two months is not advisable. We feel that if you’re engaging a lawyer to fight a legal case, or a realtor to sell your house, you’ll probably want to engage someone who speaks exceptionally well and a smooth-talker. But if you’re engaging a renovator to renovate your home, reliability, responsiveness and trustworthiness should prevail over the ability to impress you on their communication skills. Just like many victims of renovation scam who thought that their homework is done once they engaged an ID firm, this homeowner did the same. He ended up paying $43,774 upfront (funds taken from a bank loan) to the ID firm. Another victim paid $33,000 in full after the company showed them two renovated houses which the company claimed was done by them. Many of the customers paid in full even before renovation works had begun. The victims continue to receive different forms of excuses why work couldn’t start or continue. It’s interesting to note that a check with ACRA reveals that the firm is barely 1 year old and has a paid-up capital of TWO DOLLARS. The company is also not accredited by Case nor a registered HDB licensed contractor. Full story here. Never pay in full before work even starts. It’s always good to pay progressively when work is completed. Always check that the ID firm is accredited and licensed with the relevant authorities. Though how long a company is in operation should not be a major deciding factor, if a new startup has a paid-up capital of only $2, one should be cautious about considering them, not to mention paying up full. In the case of this company, it is highly likely that the staff have asked for full payment from all their customers before work is started. These homeowners fall victims to a contractor who approached them when they were collecting keys to their HDB BTO flats. Some of them paid the bulk of the costs while others paid in full. Some of them were even kind enough to offer a loan when the contractor borrowed money from them. It is understandable that most of these homeowners would want to have the renovation for their new home completed in time. So, when the contractor approached them citing cashflow problems and asking for advance payments for works to continue, most of them helplessly complied and cough out more payments. Four police reports were filed. But think about it, since there is nothing criminal about failing to fulfill obligations under a contract like physically hurting someone or operating vice, it's classified as a civil case. Therefore, there is really nothing much the police could do about it. This case involves the contractor relying on the sympathetic “cashflow problem” to squeeze out more funds from homeowners while at the same time not completing works. If ever you’re faced with the same excuses, you should be alarmed. Payments should be made progressively as work is completed. Sometimes, a contractor may be forced to fold a registered company due to the many bad publicity about the company. But there’s nothing to stop them from establishing a new company to continue with their deception. So it’s advisable for you do the due diligence of checking the background of any newly formed ID firms if the shareholders or directors ring a bell. Case stories shall be constantly updated with the most current ones. If you find a case that you feel should be mentioned here to benefit others, please contact us. If you want to protect yourself as much as possible against these errand contractors and ID firms, make sure you bookmark this page, and come back to this list and tick them off when selecting an ID firm for your renovation works. The 20 points checklist is divided into two parts. Part one consist of a checklist you want to tick off when selecting a renovation firm. And part two consists of another checklist you want to stick to when you have selected your chosen contractor. Making sure that you do not deviate from this crucial pointers. If you managed to put a tick to all the ten factors mentioned below, then you're one step closer to avoiding being scammed. Whether its private residential or HDB flats, we strongly suggest going with an ID firm that is jointly accredited by CaseTrust (Consumer association or Singapore) and RCMA (Renovation contractors and materials supplies association). ID firms jointly accredited by CaseTrust/RCMA offers the first and most important line of defence to you against being scammed. These firms are required to protect a customer’s deposit by purchasing a performance deposit bond. Which safeguard innocent homeowners against liquidation or closure of the company. Of the 1534 companies currently registered as operating a renovation business in Singapore, only less than 0.03% are jointly accredited. Which means that currently, less than 50 renovation companies is accredited. In order to qualify for the accreditation, these companies are also required to provide a clear fee policy, well-defined business system and well-trained personnel. For a list of ID firms jointly accredited by CaseTrust/RCMA, go here. Home Reno Pte Ltd is one of the 0.03% of companies accredited, So feel free to browse through all our packages and shop with peace of mind. Check that the company is at least registered with ACRA (Accounting and Corporate Regulatory Authority). If it's not found in the directory, then they are not a legitimate company. You can go to this link and search under a business entity. Be sure to enter the company name as it is. For example, Home Reno Pte. Ltd. Leaving out the full stop will return no results. If you’re renovating an HDB flat, ensure that the ID firm is also a licensed contractor with HDB. For a list of HDB licensed contractors, you can refer to this link. If you click on the link on the respective company, you can also find out more details about the company. For example, useful information like whether the company had been under suspension or demerit points sustained over the past 24 months. Check if they are at least listed a registered member as a renovation company in RCMA. A non-profit organization dedicated to promoting the industry and improving the quality and standards of the construction scene in Singapore. Even if for whatever reasons, you still choose to go with an ID company not jointly accredited with CaseTrust/RCMA, they should at least be accredited by CaseTrust as a bare minimum. Using the above link for CaseTrust directory, see if the company is CaseTrust accredited. Screen thru CaseTrust consumer alert page for companies that have been flagged with complains. Here is a link to consumer alerts you should visit before deciding on a renovation firm. Constantly check the Singapore Police Force Facebook page to get any relevant updates on complains when it happens. See to it that the company you have selected do not have any outstanding cases under investigation. Here is a sample post where homeowners chipped in to share scam alerts on the Singapore Police Force page. Before signing on the agreement, make sure you visit the firm's physical office and ensure they are operating as a business should be. Anytime you discover their office happens to be a makeshift shop or just a mailbox address, keep your money and run in the opposite direction. Make sure you compare at least 3 to 5 quotes from different companies. Regardless of whether it's a referral contractor or your bosses friend, you should have a few quotes for comparison. For a rough guide, you can also try an instant calculator here. The process of meeting different interior designers and getting their quotes also provide you with a choice of sizing up who is more reliable, who do you feel you're more comfortable with. At the same time, you might get different ideas and opinions from different IDs as compared to just sticking to one. And finally, before you sign on the dotted line and part with your money, make sure that the company you’re selecting does not offer a quote that is significantly lower than 30-40% from other companies with the exact same items and materials. If they do, you should be ALARMED rather than fantasizing that you've found a great deal. If you have read through the real stories and cases, you should probably know that greed has been the downfall of many. Going for the cheapest quote, just because it was significantly lower than the rest, opens up your vulnerability to being scammed. So the chosen one has passed the test, what next? This is where it gets tricky. Some homeowners were convinced that after they complete the arduous task of selecting an ID company, they have done their homework. Truth is, that is only half of the story. Ensuring that your renovation works will complete on time requires constant monitoring and communication. Be sure to go through the next ten points religiously so that you can be rewarded with a happy and expected outcome. Never pay more than 10% for the initial deposit before work commences. If you have chosen a CaseTrust/RCMA accredited company, then they are required to collect no more than 10% as initial down-payment. However, if you're going for non-accredited companies, they may require up to 30% initial deposit citing company policy. It's your choice. Make sure that your requirements are specified and properly documented. A timeline for the completion of works should be indicated. A progressive payment schedule should also be specified as to when and what amount the next payment should happen. Any other mutual agreements between both parties should not be just verbal but in writing as well. Each time you make a payment, it should be payable to the company engaged. Never make personal payments to a designated salesperson in his/her own name. Always collect an official receipt for all your payments made. This should preferably be done immediately each time in exchange for payment made. Where possible, payments should be made via a crossed cheque or cashier order. Bank transfers or cash are a less desirable form of payment when it comes to protecting yourself. Never agree to make full payment before all the works are complete. You should never be too sympathizing and agreeing to do so when your contractor seeks help because of cash-flow problems. In many cases, owners were too gullible to part with their money when a contractor use the excuse that "work cannot continue because of a cash flow problem". They may further explained that they have many ongoing jobs but have yet to received payments. And that you can help by making payment first so that they can purchase the materials or pay the workmen needed to continue on your work. Not only should you ask for regular updates, you should also visit on site regularly. By regularly, once a week would suffice. Rotate these visits sometimes with notifying the ID of your visits (expected) and popping by sometimes when you know no work is being done. This would give you a much better idea instead of just visit whenever they are present. Each time a progressive payment is due, always ask for an update what has been completed. And always make a trip on-site to determine if you're happy with everything before making payment. Bring a notepad or use your phone to note down items and issues you observed to be raised before making the next payment. If something is done incorrectly, be sure to bring it up before progressive payments and get an assurance and timeline when it will be rectified. Don't leave this pending until the end where 90% of the payment had been made. Fact is, contractors continue to have ongoing projects besides yours. When 90% of the payments were made, they may be too preoccupied with other ongoing new projects to resolve minor outstanding issues of yours. It not that they wouldn't attend to it. It's just going to take them longer to see to it. Communication is very important to ensure that the renovation gets done the way you expected it. Always make it a point to ensure that your ID understands what you're after so that unnecessary hiccups can be prevented. The more meticulous you are, the more detailed you can be, the better. Don't leave it to the assumption that your guy can read your mind and knows what exactly you want. Misunderstandings and delays often happen as a result of a lack of clear communication. If you have covered these twenty points and put a tick to every one of the points.... BE PROUD. You can say you have done your homework. And you're one step closer to having your dream home instead of a nightmare engaging a renovation cheat. Feel free to comment below what else can be added to the checklist. So that every homeowner can benefit from it.